Music is one of the cornerstones of life. It’s a universal language that transcends language and culture. Music helps people get through tough times, and it’s also used to celebrate the best times. The musicians that create and compose this meaningful medium deserve so much more credit and respect than they receive. It takes a certain person, with their own unique talents and visions to create incredible songs. Time and passion go into creating beautiful music. But what if you challenged yourself to write an original song, every single day, for 120 days? Could you do it? A guitar player named Samuel Orson decided to at least try. Orson is from Seattle, Washington and has been in love with the acoustic guitar for as long as he remembers. He’s also been playing for years in his unique style — finger tapping. He’s become fairly well-known for his skills. 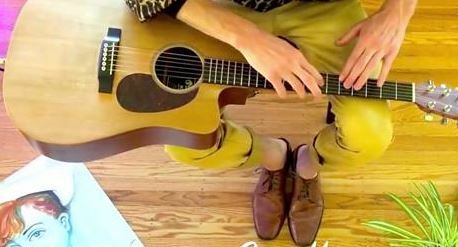 To challenge himself, he decided to set a goal — write one original finger-tapping song every day for 4 months straight. He was excited to create this musical challenge in order to keep his creative juices flowing. Continue to the next page to see some of these incredible songs. We can’t believe all of this was flowing from his mind every day!